The term “sophomore slump” is often used to describe students who enter their second year of college with less excitement than they did their first year. Performance may slip, effort may drop and determination may falter. 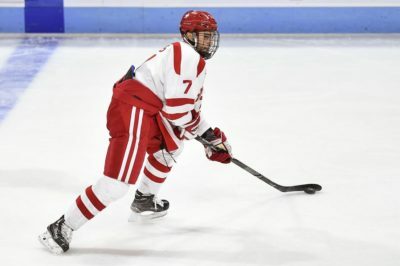 However, for Boston University men’s hockey team sophomores Dante Fabbro and Chad Krys, that “sophomore slump” does not seem like it is going to kick in anytime soon. After impressive inaugural seasons with BU, the two defensemen begin their second year as Terriers with hopes of building on their previous year’s success, using their experience to lead three new freshmen defensemen and help the team bring a few championships back to Boston. While senior members of the team stated that the transition from freshman to sophomore year can be the toughest from added playing time to higher expectations, BU head coach David Quinn called it the best transformation for players. Like most sophomore students returning back to campus after a long summer away, Fabbro and Krys said they both feel more confident coming into the 2017-18 season. This is a confidence that most likely stems from experiencing a full-year of collegiate hockey from the highs of amassing an eight-game win streak to the lows of narrowly missing the Frozen Four. Despite their successful first years, Quinn said he believes the two players can raise their game to an even higher level this season. “Hopefully these guys continue to grow and use that confidence as a springboard to having a much better season than they did last year, not that they didn’t have a good year, but I think there’s just a lot more that they can give,” Quinn said. Over the four months of summer, the pair said they each worked on strength and speed training to gear up for the long season ahead that consists of 36 regular-season games. Although Fabbro and Krys entered the new season having already amassed 18 and 11 points, respectively, this air of confidence and familiarity from the two-way defensemen was evident from the first puck drop of the Terriers’ season home-opener against then-No. 16 Union College on Sept. 30. 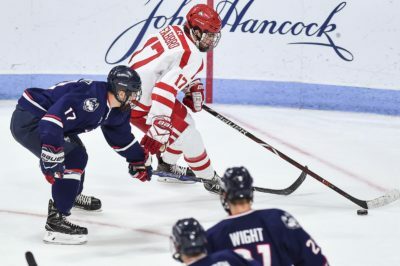 The nerves, hesitancy and newness of being a freshman on the team was long gone as Krys tallied as many shots as a forward and Fabbro scored a one-timer off a pass from sophomore forward Patrick Harper to give BU a lead it would not relinquish in the 4-1 win. Fabbro said, with a smile and almost relief in his voice, that it was nice to collect his first goal of his second year early. “It was a great pass by Harper to see me back there, but it’s definitely nice to get that out of the way,” Fabbro said. Already six games into the season, Krys has established himself as a large force in front of the net and has notched 22 shots, more than one third of the total he had all of last season over 39 contests. Krys mentioned that his increased physicality this season is something that has been encouraged by Quinn. “It’s something that Coach Quinn’s really emphasized for me everyday, to take responsibility defensively, and try and be as physical as I can and be as hard to play against as I can,” Krys said. On the other hand, Fabbro leads the team in blocked shots with 18. Senior defenseman and captain Brandon Hickey noted his linemate’s disciplined style of play on the ice. From the stands, the blueliners can be heard on the ice communicating to the other defensemen. Senior defenseman John MacLeod, who is frequently paired with Krys, said this communication on the ice, especially between defense partners, is something that is instilled in the players and noted that Krys is a vocal leader. While another year comes with more responsibility, it also comes with lessons they learned on and off the ice from their respective defensive linemates. Fabbro and Krys each voiced that the biggest thing they learned was putting in hard work away from the rink and they both said they hope to lead the new freshman players — Cam Crotty, David Farrance and Kasper Kotkansalo. Fabbro, who Hickey has described as someone who leads by example, said the main message he wants to give to the new players is to stick to their game. “Obviously it’s a tough game in college hockey and I know there’s a lot of big guys out there, but if you just play your game and develop in practice and in the weight room, I think nothing [except] good things can come out of that,” Fabbro said. The three freshmen, who were all drafted in the third round of the NHL Entry Draft this summer, make up three of seven defensemen on the team that have been drafted to professional teams. Among those seven include Fabbro and Krys, who were drafted No. 17 by the Nashville Predators and No. 45 by the Chicago Blackhawks, respectively, in the 2016. Although being drafted will remain a milestone for any young hockey player, it comes with distractions from the outside world that a player must stray away from. There are certainly things the defense can improve upon, Fabbro said. One of the key things is communication, but the sophomores are confident that the Terriers’ defense will bring a similar impact as last season and has a lot to offer this season.